In a modern world the laws of the jungle apply – those who can produce efficiently survive, whilst the rest languish. Management is about more than buying cheap and selling expensively. Off course you need to find the best price both when buying and selling goods, but it is just as important to continuously optimize production - also in aquaculture. The fish farmer must maximize output from the available resources, and remember that the lowest possible FCR is rarely the goal. Good growth can be just as profitable. When selling feeds for professional aquaculture you are often involved in discussions about the right choice of feed and feeding strategy. Highlighted in this text you will find some of the aspects to consider. Modern farm management is primarily focused on planning. Without planning you cannot run an efficient operation, and you will at some point find yourself not utilizing your fish farming facilities in the best possible way - either due to lack of biomass in terms of numbers or size. It is a bad situation when you are unable to feed the fish in an optimal way due to unfavorable conditions or overstocking. Large amounts of money have been lost when fish farmers have had to hold back fish. An even worse scenario is to choose to start feeding to color the fish (f. ex. when producing trout); to later discover that you and many others have large red fish that there is no market for. The fish must be produced in order for them to be ready when the market is – just in time – no sooner and no later. An increasing share of fish is sold to processing plants and supermarkets, which to a increasingly larger extent regulates the market. This leads to the necessity of entering into long term contracts with set delivery dates, and this again makes the processing-industry prefer suppliers who can supply a predetermined amount of fish at an agreed time. This is a challenge for some, and an opportunity for others. Fixed contracts are the first prerequisite for creating a production plan, aiming for a minimum of idle production time or overstocking. Planning production of animals is obviously affected by biology and weather conditions, and thus to an extent uncertain. This increases the need for careful planning, makes the challenge bigger and makes it necessary to adapt plans continuously. A crucial part of planning is determining the feeding strategy. A feeding strategy obviously encompasses a choice of feed, but more importantly you should decide on the amount of feed which should be used in all phases of production. Good farming conditions are a basic requirement for animal welfare, although real life conditions do not always provide for this. The actual farming conditions should be considered when planning. 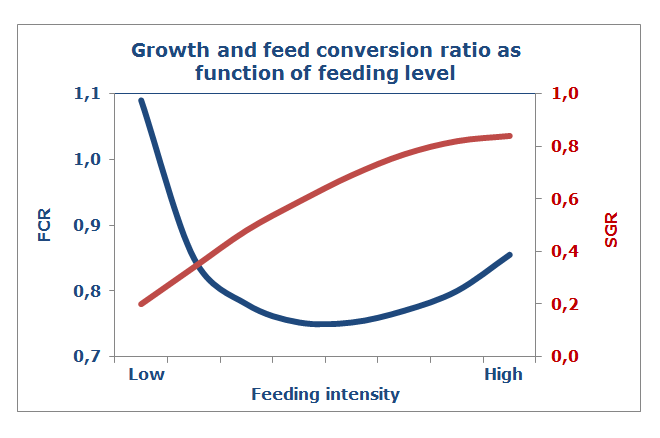 The feeding strategy should aim to achieve the highest possible growth within the given parameters. A possible exception to this rule could be made in situations with limited access to feed, or when regulation demands minimal loss of nutrients. These scenarios can make it relevant to focus on maximum utilization of the feed, equaling a low feeding quota (FQ). However, the vast majority of fish farmers focus on optimum growth, equaling a high daily growth rate (DGR). All fish feed producers offer recommended feeding tables, stating the recommended amount of feed which should be fed to healthy fish under good farming conditions. It is important to note that these feeding tables are recommendations. Varying farming conditions could mean that it is not possible to feed as much as stated in the feeding tables, whilst other conditions may enable you to feed much more than stated. The recommended feeding tables often focus on good feed utilization, i.e. a low feed conversion ratio (FCR). However, this rarely equals optimum growth. It is a well-known fact that intense feeding gives fast growth, but also a higher FCR. The high FCR is primarily due to the larger amount of wasted feed. Most fish farmers are aware that very restrictive feeding also gives a higher FCR, which is due to the amount of feed utilized for the daily maintenance of the fish. The correlation between feeding intensity, growth and FCR can be seen in graph 1. The graph shows how restrictive feeding results in slow or no growth, indicating that all of the feed is utilized in fish maintenance, and resulting in an extraordinarily high FCR. The graph further shows that more feed equals increased growth, until a point where the fish no longer eat all of the feed, and the FCR again begins to rise. Typically, the optimum level of feeding for high growth is a great deal above the optimum feeding level for low FCR. This correlation allows for optimization of production economy. The gap between these two levels is again dependent on the price correlation between feed and fish – the more expensive the fish is compared to the feed, the further the optimum feeding point moves to the right – toward intensified feeding. A simple calculation can illustrate this relationship. The table below shows a calculation example for a trout production. The 20% increase in growth is achieved at the expense of a 10% higher FCR. This means that the feeding expense goes up by 10% per kilo of produced fish. The increased feed expense is however more than compensated by the increased production. In this example the result is more than 800 Euros of extra income for the increased growth, despite the higher FCR. As a feed producer it is interesting to expand the calculation. 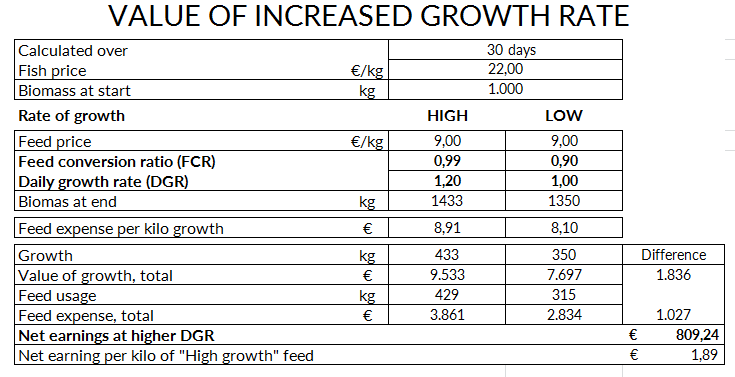 At the very bottom of the calculation you can see that you can pay 1,89 Euro/kg more for the high-growth feed, than for the alternative, as long as feed is the only parameter for the difference. The number highlights that there are money to be made on growth, whilst it would still be affordable to invest in necessary changes. As mentioned, feed is just one of the tools to achieve better growth. It is obvious that a feed needs to be tasty, to entice the fish to eat, whilst also being rich in energy, highly digestible as well as optimally composed, to support high growth rates. The fish need to be able to grow from the feed. This generally means that the first step to optimized production is choosing a better/more expensive feed. A more expensive feed should be used more carefully and requires more effort of both the fish farmers and his/her colleagues. If the requirements are met, the result is almost guaranteed a better economy. An argument against better and more energy-rich feed is usually that it leads to fatter fish and thus increased loss when the fish is slaughtered. This loss is very tangible for the fish farmer, who sees it as a wasted investment in better feed. However, the calculation does not end here. Differences in fish growth rates have a larger effect on its weight, than on its length. This means that slow growing fish gain less weight than length. This most likely result in the amount of intestinal fat being less when feeding restrictively, but the amount of bones and skin is larger. It can often be seen that the amount of filet remains the same, despite the fish growth rate. And the fillet is the goal of fish production. Common for all fish farmers are that maximizing fish growth is crucial for economy. If it exceptionally is no longer interesting to produce larger amounts of fish, growth optimization will contribute to maintaining the production volume based on smaller stock, with all the advantages of less tied capital, better conditions for the fish, including lowered risk of disease and overstocking. Each fish farmer has different options for optimization, but there will always be places in the operation which can be optimized. One just needs to take notice, and be ready to make the necessary changes.